I can't remember a time when I wasn't being creative. As a child I was always happy with either a jigsaw or a packet of crayons and a colouring-in book. Throughout school, I enjoyed art with success therefore it seemed a natural progression to pursue my talent and interest from GCSE onto A� Level. I undertook a BTEC Foundation course in art and design at Harrogate College where I was encouraged to experiment in painting, printmaking, photography and fashion design. At this time, my passion for painting and drawing floundered and my interest in fashion emerged. I completed my BA Hons Degree in Fashion Design at Salford University in 2001. Having moved to Harrogate from Knaresborough and spending 4 unfulfilled years in retail management, I embarked upon a total career change and qualified as a Teacher of Art in 2007 teaching 11-18 year olds. I have been privileged to work alongside talented art teachers and students alike, a constant source for inspiration and to learn new techniques. I left teaching in May 2014 to pursue my art career. 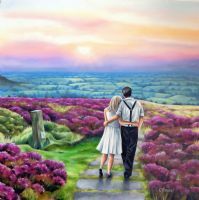 Alongside bringing up my young family, I currently work as an artist where I live in Harrogate. 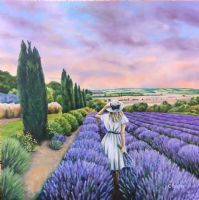 Working predominantly in oil, I paint mainly figurative landscapes and frequently work on privately commissioned pieces. Please see 'commission a painting'. I take many location photographs, edit them on Photoshop and then sketch my figures and develop a tale for the characters. I love to use colour in my work as it enhances the fun element to my paintings. I rarely reveal the characters faces as it encourages anonymity and allows the viewer to narrate the picture and make it personal to them!. Collectors have bought my work locally, nationally and overseas, reaching as far as New Zealand. I have worked with many galleries and currently work closely with Whitby Galleries, Art in the Mill in Knaresborough and The Coastal Gallery in Northallerton. I have also exhibited at Ripley Castle, Living North - York, The Great Yorkshire Show, Country Living Show, Art in the Pen in Skipton and The Edinburgh Arts Fair and The Glasgow Arts Fair.